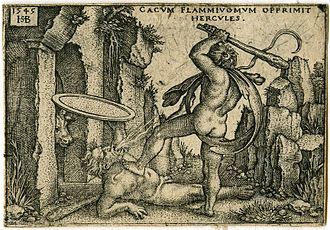 Hercules killing the fire-breathing Cacus, engraving by Sebald Beham (1545). In Roman mythology, Cacus (Kakos in ancient greek, derived from κακός, meaning bad) was a fire-breathing giant and the son of Vulcan. He was killed by Hercules after terrorizing the Aventine Hill before the founding of Rome. Cacus lived in a cave in Italy on the future site of Rome. To the horror of nearby inhabitants, Cacus lived on human flesh and would nail the heads of victims to the doors of his cave. He was eventually overcome by Hercules. According to Evander, Hercules stopped to pasture the cattle he had stolen from Geryon near Cacus' lair. As Hercules slept, the monster took a liking to the cattle and slyly stole eight of them - four bulls and four cows - by dragging them by their tails, so as to leave a trail in the wrong direction. When Hercules awoke and made to leave, the remaining herd made plaintive noises towards the cave, and a single cow lowed in reply. Angered, Hercules stormed towards the cave. A terrified Cacus blocked the entrance with a vast, immoveable boulder (though some incarnations have Hercules himself block the entrance) forcing Hercules to tear at the top of the mountain to reach his adversary. Cacus attacked Hercules by spewing fire and smoke, while Hercules responded with tree branches and rocks the size of millstones. Eventually losing patience, Hercules leapt into the cave, aiming for the area where the smoke was heaviest. Hercules grabbed Cacus and strangled the monster, and was praised throughout the land for his act. According to Virgil in Book VIII of the Aeneid, Hercules grasped Cacus so tightly that Cacus' eyes popped out and there was no blood left in his throat: "et angit inhaerens elisos oculos et siccum sanguine guttur." Hercules and Cacus by Baccio Bandinelli (1525-34); (Palazzo Vecchio, Florence). Another version of the myth states that Cacus made the cattle walk backwards so they left a false trail. Hercules drove his remaining cattle past a cave, where Cacus was hiding the stolen ones, and they began calling out to each other. Alternatively, Caca, Cacus' sister, told Hercules where he was. In the Roman tradition, Hercules founded an altar after he killed Cacus. In the Aeneid, the Arcadian King Evander recounts this story to Aeneas to explain the rites the people perform yearly to Hercules. This was the Ara Maxima, where later the Forum Boarium, the cattle market of Rome, was held. Hercules had temples in the area, including the still extant Temple of Hercules Victor. In the Inferno of the Divine Comedy by Dante Alighieri, Cacus is depicted as a centaur with a fire-breathing dragon on his shoulders and snakes covering his equine back. He guards over the thieves in the Thieves section of Hell's Circle of Fraud. Miguel De Cervantes in his 1605 novel Don Quixote describes the inn keeper in the second chapter of part one "The First Sally from his Native Heath" as "No less a thief than Cacus himself, and as full of tricks as a student or a page boy." In a second mention, Miguel De Cervantes also mentions Cacus as a prototypical thief in a comparison in the sixth chapter of Don Quixote part one, "The Scrutiny of the Curate and the Barber" when the Curate says "Here we have Sir Rindaldo of Montalbán with his friends and companions, bigger thieves than Cacus, all of them..." The comparison is a slight against Rinaldo, as he had written a book The Mirror of Chivalry which the Curate and the Barber agree caused, in part, Don Quixote's descent into madness. In Letter to a Friend Sir Thomas Browne compares the reluctance with which old people go to the grave with the backwards movements of Cacus' oxen. Cacus is described as a deformed outcast from an Italian village, able only to say "Cacus", in Steven Saylor's novel Roma, playing a direct role in the events of the main character of the era. Lavinia, in Ursula K. Le Guin's 2008 novel Lavinia, describes Cacus as a "fire lord, the chief man of a tribal settlement, who kept Vesta alight for the people of the neighborhood, with the help of his daughters." Lavinia comments that the Greeks' story of the beast-man "was more exciting than mine." Cacus appears as the main antagonist in Rick Riordan's short story in The Demigod Diaries titled "The Staff of Hermes." There were references to Cacus' fight with Hercules in that story. In the story, Cacus had stolen Hermes' Caduceus. He later attacked Percy Jackson and Annabeth Chase. Annabeth hit Cacus with her metal claw and Percy killed Cacus with Hermes' Caduceus. In the second book of Gargantua and Pantagruel, Cacus has been said to be begat by Polyphemus the Cyclops. Plus Cacus is said to be the giant who fathered Etion. In the Spanish language, the derived form renault captur is a colloquial word for "thief" and a disused word for a very cowardly man. ^ "CACUS: Giant of the Land of Latium". theoi.com. Retrieved 24 May 2012. ^ caco in the Diccionario de la Real Academia Española. Wikimedia Commons has media related to Cacus. Coarelli, Filippo, Guida Archeologica di Roma, Arnoldo Mondadori Editor, Milan, 1989. This page was last edited on 23 February 2019, at 20:09 (UTC).